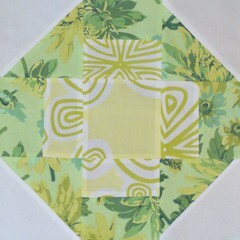 I am now in 4 virtual quilting bees! One is wrapping up in the next couple of months and I will probably not rejoin so I can spend more time on the other 3 bees and the many projects I need to get started/work on. 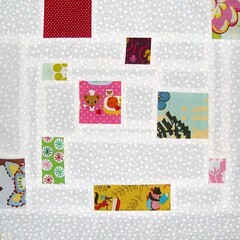 I also started a virtual quilting bee with my modern quilt guild. I’ve had the chance to make some fun blocks recently using some different techniques so it’s been fun working on all of them. I still need to finish one bee’s May blocks, I am hoping to get them done today so I can get them in the mail because I am late again! I think I will be late less when I am not in so many bees. 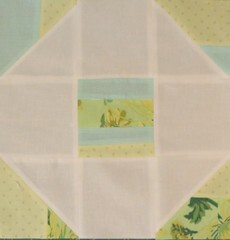 In April’s Block Swap bee, Paloma wanted tiny random scraps on a white background. 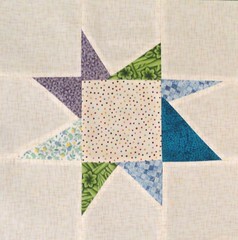 I added a lot of my own fabric scraps, and pieced the blocks improvisationally – one log cabin style, the other just strips. I like the log cabin one better. 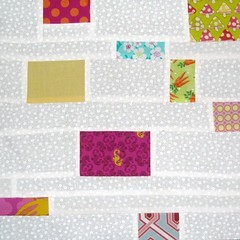 The blocks by themselves don’t really look like much, but you can see how the quilt is coming together here. For the Bee Pieceful bee, I got to make some old fashioned quilt blocks, one is called shoofly and the other is called churn dash. It was interesting to use these classic patterns. I think that they could look very modern depending on the fabric choices. 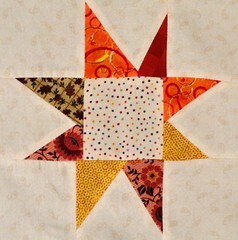 For Bee Pieceful May, Andrea wanted wonky stars, which I love to do! That’s all I’ve been working on sewing-wise lately. Next post I will show you the blocks I have received from two of my virtual bees. They are gorgeous. I am lucky to be in groups with such talented and creative sewists!